And then Krsna brings the sheet of transparent plastic with the hole in it, which is the subtle body. 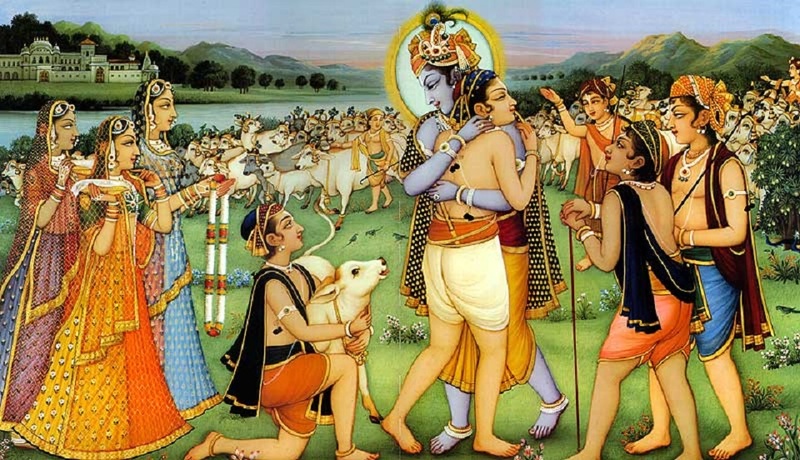 Then Krsna brings the huge overcoat – the gross body which the jiva has to wear as well. 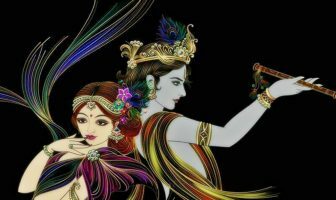 Then he gets these parcels – material desires, lust, greed, anger and the jiva has to balance all that, ready for the material world! The curtain closes and the next scene shows bhakta in the huge cradle with the baby head on and his feet are waving at the audience! Boy, that was really good! 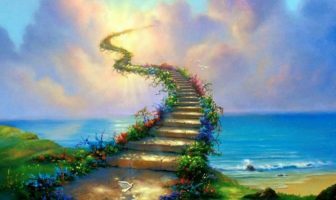 That is exactly how it is; here we are in the material world, now forgetful of the spiritual world and now anxiety begins which has become our second nature. 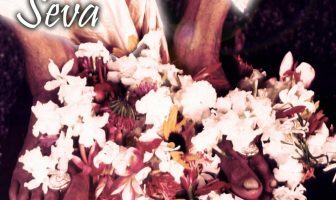 Krsna feels our absence, Krsna has been waiting all this time and Krsna even has come with us to the material world, as Paramatma. 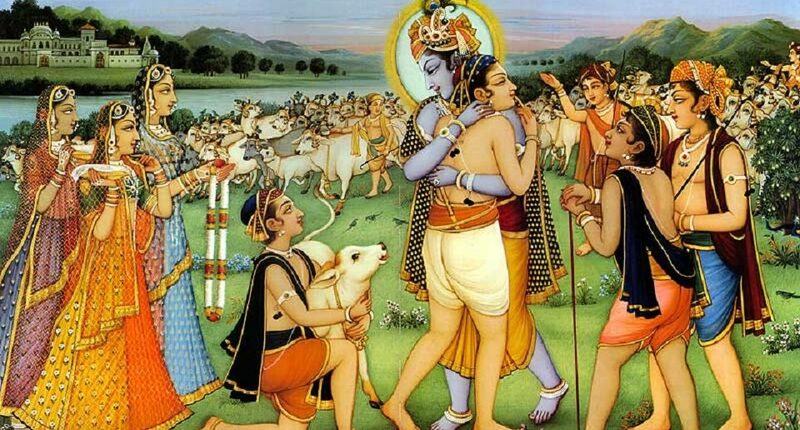 In the spiritual world, there is no Paramatma in the heart of the eternally liberated souls – that is only in the material world because when the living being wants to go and leave Krsna, Krsna says, ‘Alright, yes. 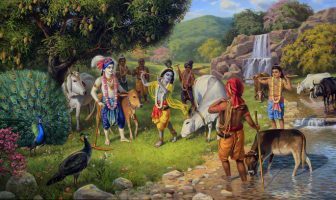 Alright then, you go.’ But meanwhile Krsna goes with him, hiding in the heart all along. 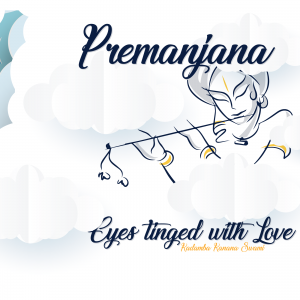 ‘But I don’t see anything?’ Yes, because Krsna is hiding in the heart! 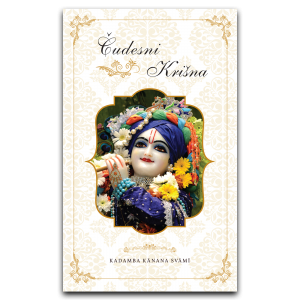 Sometimes Krsna is sort of hinting, ‘No, no, not left, go right, go to right path, not the wrong one.’ Some say (in a proud voice), ‘It is my conscience, it is my inner voice, it is a part of me!’ No, it is Krsna who is kindly accompanying us on our material journey and in this way, we can appreciate that actually we are never alone – never, ever. And therefore we can face the greatest difficulties, because we realize – Krsna is always with me! Therefore, what can go wrong! ?